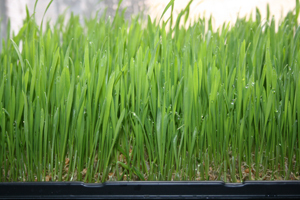 This was my first time growing wheat grass and I have to admit it was quite easy! It was actually fun to watch it grow. 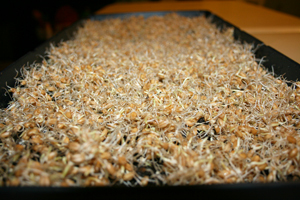 step 4- The wheat after 2 days of sitting without water in a dark place will have white sprouts starting to form. Vegas is very dry so normally it would take half the amount of time for the grass to start sprouting but since we have pretty much zero moisture here it will take a bit longer. 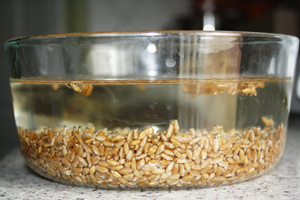 So I am going to let it sit for another 12 hours then rinse and see if its ready. 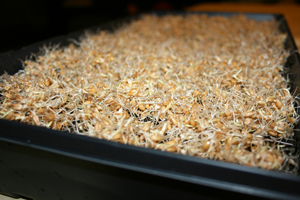 You will know if its ready when you see it sprouting…you’ll want a good quarter of an inch of growth before planting it. 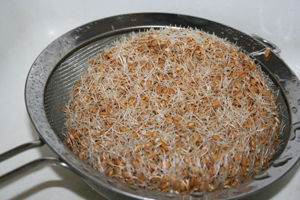 step 5- Once you have a good amount of growth sprouted on the seeds its time to plant! You will need some planting soil and a plastic planters box. 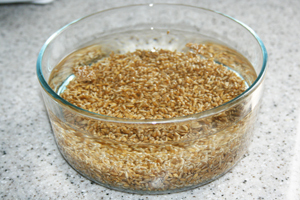 Just spread out a good amount of soil and water it, then spread out the seeds evenly onto the soil. Then keep the soil moist. During the first three days of growth, water once a day in the morning and really soak the soil (until the tray drips is a good sign you are watering enough). 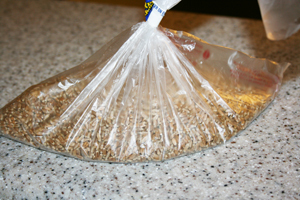 Then lightly mist your seed in the evening (lift cover off to mist seed). Put it in a place where it will get partial sunlight and in a couple days it should start growing tall. step 6- On the fourth day, uncover grass (roots should begin to take over your soil), water heavily once a day and keep the grass in the shade (never direct sunlight). For mold problems, increase your air circulation with a fan or air conditioning to keep the temperature between 60 and 80 degrees F. Harvest grass when a second blade of grass appears on the grass blades, or when the grass “splits” toward the bottom of the blade. Average growing time is seven to 12 days, depending on the weather, but still always watch for the second blade of grass as you can never judge by how many days it has been growing or how tall the grass is. And Congrats you did it! 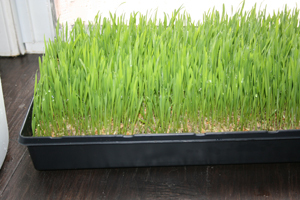 Wheat Grass! Now cut the blades and juice away and enjoy! Looks like a project I am going to try out! Typically how much does it take to get 2oz of juice? Jeez, thanks very much for posting this! It is going to help when I buy wheatgrass at the grocery store! Very Cool!